Our Earth needs us to recycle. From old homework assignments to broken toys or old car batteries, our planet needs us to take care of the waste. And this is a message that our children also need to learn. We want to leave behind the best possible world for our children and it’s important for them to understand that they need to take responsibility too. I am a strong believer that recycling should be a part of our everyday life, and luckily, it has become easier to do so. Still, while us adults understand the impact recycling has on the planet, for kids the whole concept might be a bit hard to comprehend at first. So here are four easy steps we can take to explain recycling to them and get them on board to help the Earth. This post includes affiliate links (read more about what this means here). 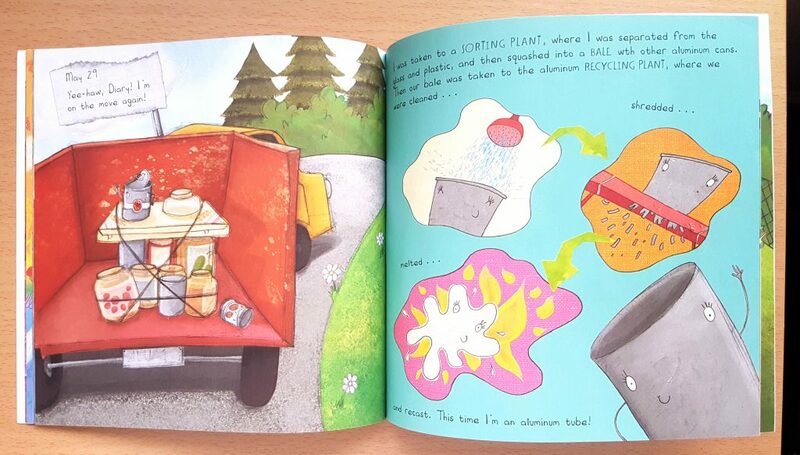 Also, you can read with them some lovely books on the topic, books that picture the exact process of recycling in a way that kids can relate and understand better the whole concept. It’s important to explain the benefits of recycling to the kids so that they want to be involved in the action. And we can do this in more ways. We can start by telling kids that for example through recycling, old materials are converted into new products, therefore the need for natural raw resources is reduced, which means nature is preserved better. For example, 1 tonne of recycled old glass saves 135 litres of fuel and replaces 12 tonnes of raw materials. Also, at present less than 25% of the paper in use is recycled and the rest is produced from wood pulp, therefore recycling paper would save more trees. 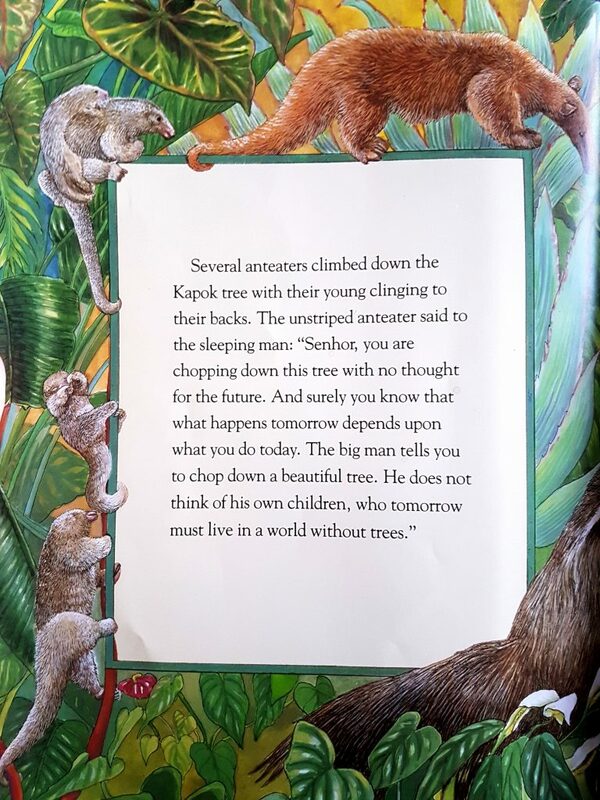 At this point, you can also read books with your kids about the importance of recycling, like “Why should I recycle?“, or about the importance of saving the trees. 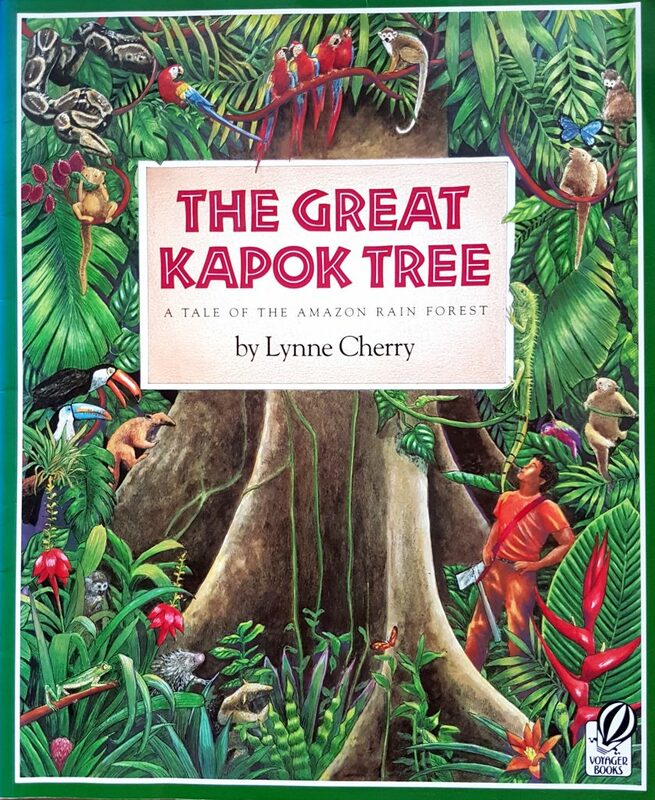 I can strongly recommend ‘The Kapok Tree“. 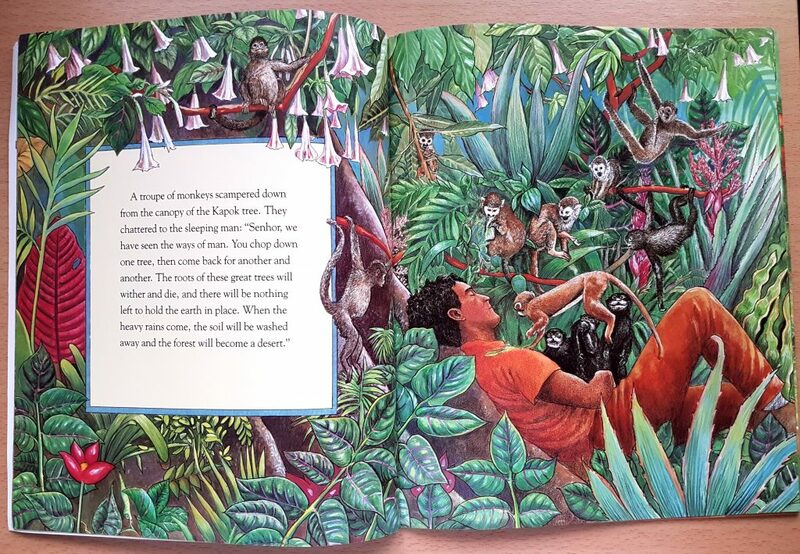 It’s beautifully illustrated and written with a clear and strong message coming from the animals in the Amazonian Rainforest. 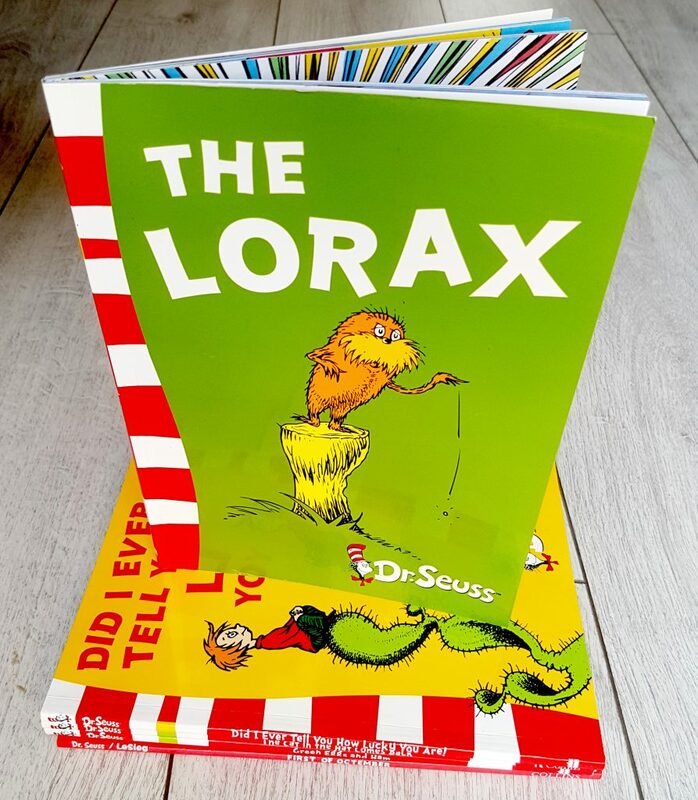 Another book that shows the possible impact the lack of recycling could have on our Planet is “Lorax” by Dr. Seuss. There is also a movie with the same name made after the book. Speaking of movies, “Wall-E” is another movie for kids that portrays what could happen if all the natural resources in the world are used [recommended for kids over the age of 5]. Also, “FernGully: The Last Rainforest“, a movie for kids over 7-8 years of age about the FernGully forest that is endangered, promotes environmental, conservation and anti-animal testing messages. Furthermore, less energy means less greenhouse gas emissions (greenhouse gases trap the heat formed in the lower atmosphere and the Earth’s surface and prevent it from escaping back to space, thereby causing a rise in temperature). A landfill is an area where all of the non-organic and un-recycled items go, filling the land (hence, landfill). Whatever is not put in recycling bins or taken to a recycling centre, ends up at a landfill site and this can cause an environmental hazard: dangerous liquids can be washed through the soil, contaminating drinking water, the land can become poisoned and unsafe for farming or building. When we recycle material, this means the amount of rubbish sent to landfill is decreased, which reduces the harmful chemicals and greenhouse gases that the rubbish releases. At present less than 25% of the paper in use is recycled and the rest is produced from wood pulp. The bleach used in making white pulp for the paper can cause water pollution. Toxic wastes such as dioxin are amongst the other wastes discharged from pulp mills. Recycling paper reduces the need for bleach. Another example is oil which, if not recycled, is sometimes poured down the drains. Oil can be a serious pollution problem when it reaches the waters as it can produce a thin film over thousands of square metres and kill plants and animals. Interesting fact: 4.2 million tonnes of food and drink waste is still thrown out annually. That’s the equivalent of six meals every week for the average UK household. Interesting facts: For every tonne of paper used for recycling 17 trees are spared and the manufacture of recycled paper uses only half the amount of energy and water used in making new paper. Interesting facts: most plastics in use are made from crude oil and resist any form of biological decomposition, which means they persist in the environment for thousands of years. Burning them in waste incineration releases poisonous gases into the air. At present just 43% of the 13bn plastic bottles sold each year in the UK are recycled, and 700,000 are littered every day. 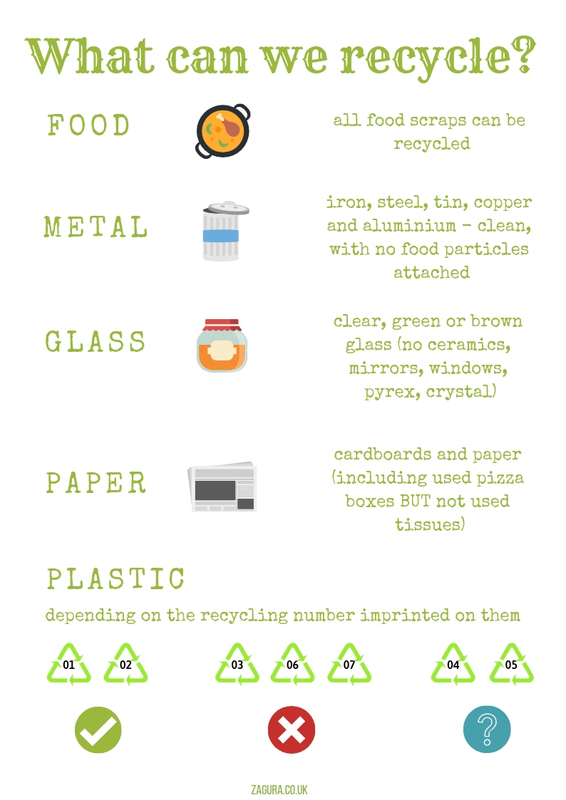 Here is a printable file (click on the image to instantly download it) which you can print and keep at hand in your house so you can all easily remember what can be recycled. An important aspect that needs mentioning to the kids: all containers need to be rinsed before putting them in the recycling bin. Many things that are recyclable become no longer recyclable when they have food residue on them (though this depends on each area individually, some recycling centres are equipped to handle some food residue). Interesting fact: A refining company can produce up to 3,500 litres of usable oil (lubricating oil or heating oil) from every 5,000 litres of processed waste oil. Interesting fact: textiles and shoes make up 12% of landfill sites (700,000 tonnes of recyclable textiles/year), but at least 50% of these could be recycled. Interesting fact: batteries are non-biodegradable, therefore they don’t break down in landfills, but stay there forever. They can also leak into the ground, polluting the environment. But recycling batteries means many of their materials will be used to make new batteries. 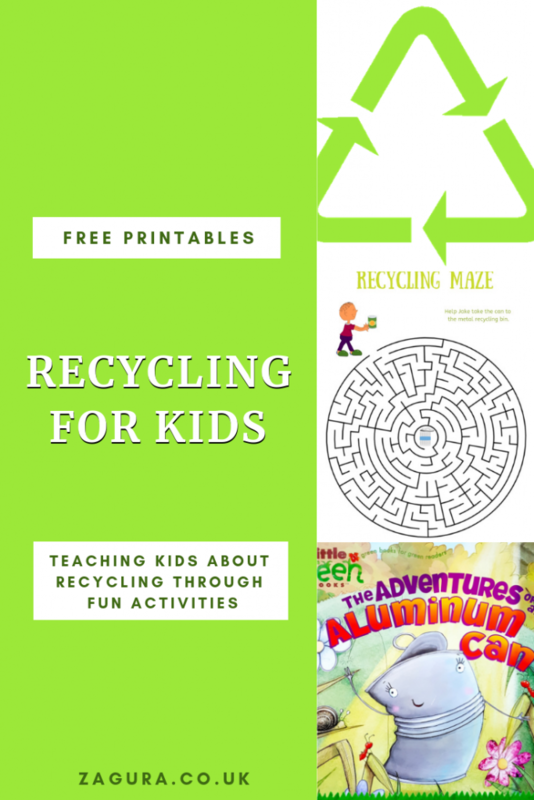 Recycling shouldn’t be a boring chore for the family, but something fun, and it’s up to us to make it enjoyable and fun, especially at first when we introduce all this information to the kids. 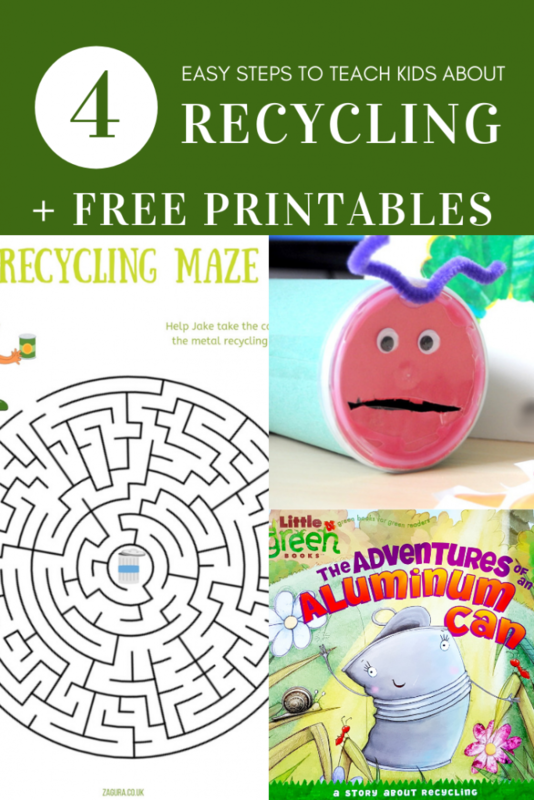 I’ve created a printable file with some activities for kids to enjoy while practising what they’ve learned about recycling. Here is a preview of the file which you can be sent to you via email by completing the form below. 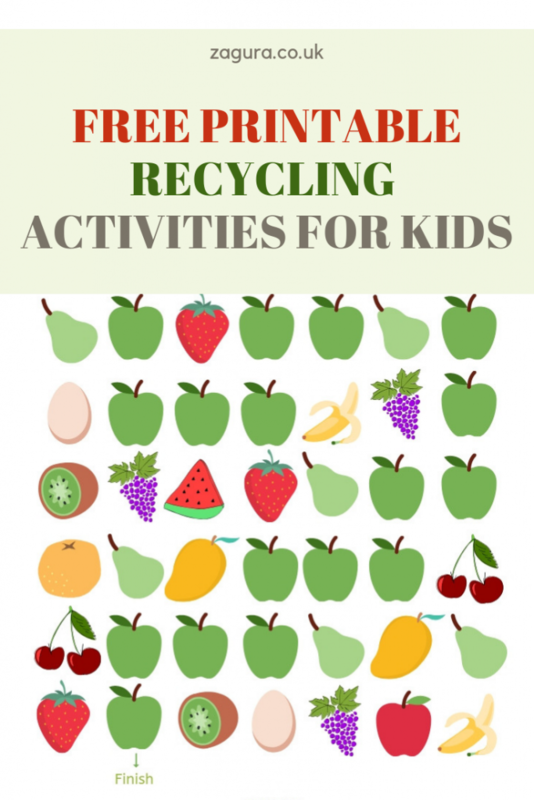 On which email do you want to receive the free printable activities file? Check the field above if you would like me to share with you my future blog posts. There will be no spam and you will be able to unsubscribe at any time. Now that kids know what materials can be recycled, all they need is some bins for food waste, plastic, paper, glass and metal, accesible to them, which they can independently use to sort old materials and recycle them. We use the bins from the local council and the kids have learned to read the labels and sort the rubbish accordingly, but you can buy the cheapes heavy duty tubs you can find and let the kids use markers or paint to write on each one Plastic, Paper, Glass, and Aluminum. 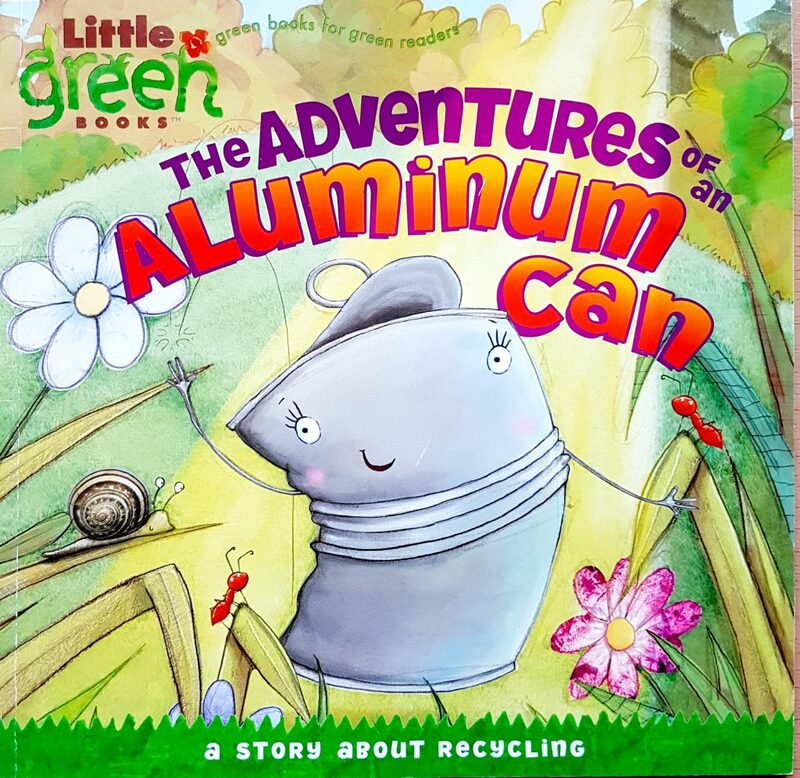 Note: Some countries (and soon UK I hear) have locations that will pay you for recycling glass bottles and aluminium cans, which can be a fun way for your kids to earn a little extra money while helping he environment. 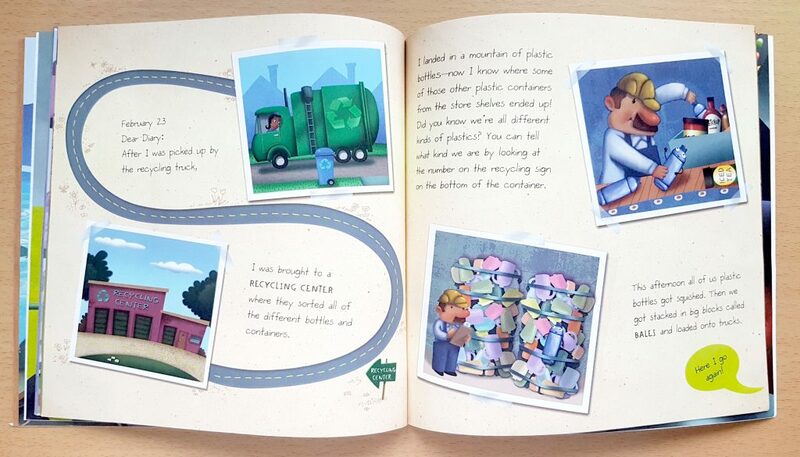 It can be difficult to spot recycled products as they sometimes look as good as the new ones, but it’s so exciting for kids to start spotting products made from recycled materials, and paper is the first they can learn to spot, especially since all of the newspaper made in the UK is now made from 100% recycled paper. Seeing recycled materials and products around them makes them realize that recycling is important and they can be an invaluable part of it. We can’t teach our kids to recycle while we are wasteful. They learn by observing us, and if we are involved in recycling, they will become involved too. You can simply make sure you are recycling everything you can around your home, and you can also participate in Earth Day activities or join community efforts to recycle and reduce waste. Some UK councils are willing to send handheld rubbish picker for free, but you can also buy some online (like these ones here), and with some gloves and a few bags (one for paper, one for plastic and cans and one for waste for example) you can go for a 15 minutes walk in a park or on your own neighbourhood sidewalks and hunt for trash, while also learning to sort the different types of recyclables. I know some of my son’s colleagues have already done this and they loved it, therefore my son wants to do this too! So yes, this activity is fun and helps spread the word that recycling matters and that each of us can make an impact in our community. If possible, check some local recycling centers to see if they do tours or workshops for kids. Or simply take them whenever you go there, so they see you in action and see other people recycling as well. Also, check the local museums and aquariums, some of them might have recycling workshops or display art created from recycled material. I remember one time we were visiting London Transport Museum and we joined a workshop where kids made musical instruments using recycled material, and at the end, they all ‘sang’ a song! It was loud and crazy, but extremely fun for the kids! And another time we were out for a walk and in a marketplace there was an organization with a display formed of things collected from the ocean: wellies, hats, plastic bags and so on. That display made an impression on everyone who walked by. Collect recyclable materials for some art and craft projects you can do at home. You can have a storage box where you can keep plastic bottles, egg cartons, toilet paper and paper towel rolls and cardboard boxes. If you need inspiration, here is my post with 20 art and craft projects using recycled materials. Check with your PTA or school to see if there is a need to recycles for school projects. Teachers are often looking for additional supplies to help make learning fun. The latest project at my son’s school involved a plastic bottle that they turned into a rocket. And the latest project at my daughter’s pre-school involved plastic pots for plants. And in both cases, the kids were the ones who brought in the bottles and pots. I love this! I think it’s so important to teach our kids how to take care of this planet, and that includes teaching them how to recycle. I would say that this way is brilliant and not only could it be useful for children, but also for adults. Recycling is life. What great books to teach children about the environment; thank you for sharing, I will have to get these for my kids! 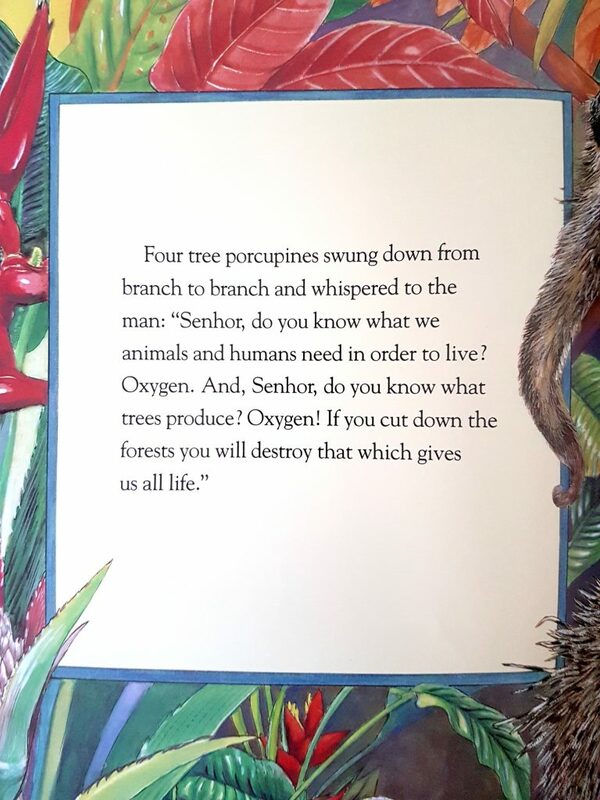 Love that these books speak to young people about how to care for our planet; great idea! I don’t have kids but this is amazing! Love the video, it is great. Thank you so much for this great post, it is very very important to teach kids about the importance of recycling. This is very informative! I try and teach my kids about recycling, they are still pretty young. But keeping the world a clean place is so important. I especially love your book recommendations. It is important to take care of the planet, it’s our home and will be our kids’ as well. I’m glad you like the books, I love them too, so beautifully illustrated and written! 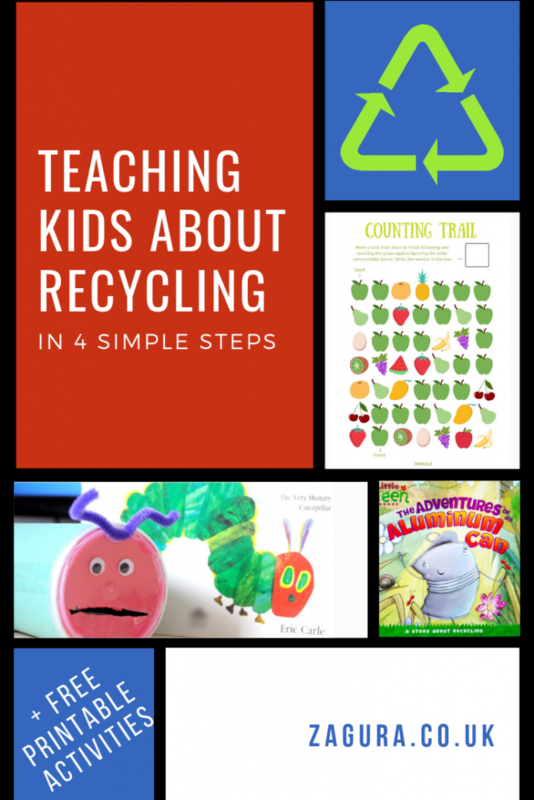 Those are great resources to use to teach children how to recycle! I need to do better at teaching my children how and what to recycle! These are great tips, and very important! I wasn’t taught about recycling until my roommates in college helped me understand what can and can’t be recycled. It’s important to teach our children at a young age! It is so important to teach kids about recycling. I like how you do it in a very fun way for the kids. Start as early as possible so it makes it a habit. 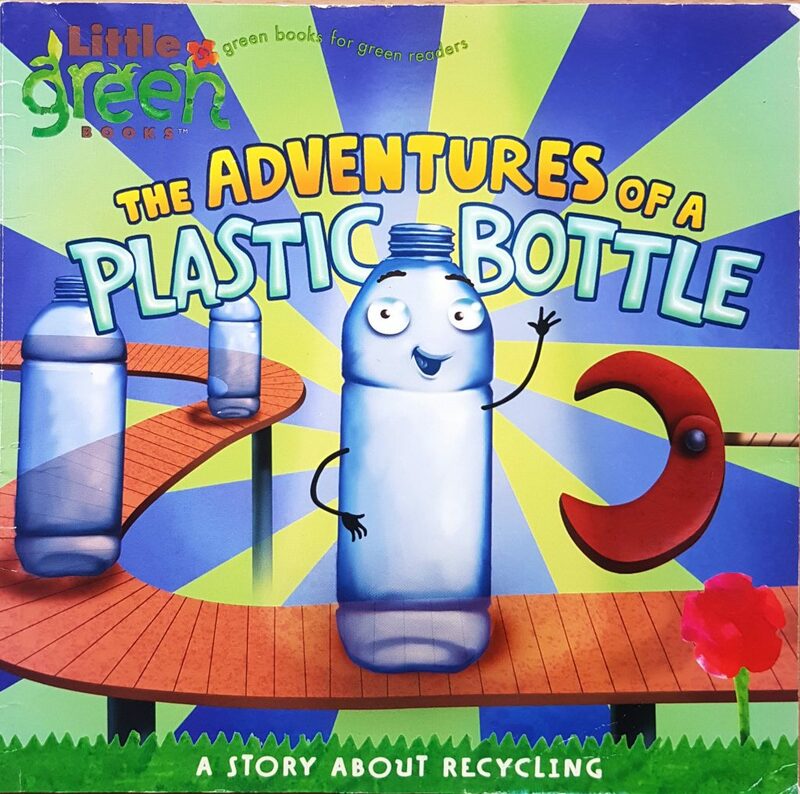 Awesome tips about teaching kids about recycling. It is the order of the day for our next generation. We’ve been really lucky because the school has taught my kids what recycling is. I think they know more about it than I do. Informative and insightful post. Recycling can indeed solve many environmental problems. This is such a great guide. I’ve made sure to teach my kids as much as I can about recycling and sometimes I find they are even better than I am at remembering! Oh wow, That was a great idea. Such a great activity to teach our kids recycling. This could save our planet. This is such an important topic to teach kids when they are young. We definitely recycle here at home and have made it a point to make sure our kids know why we do so. Yes I love this! I’m all about protecting our environment. These are good tips for young and old! Although I’ve never precisely lectured my children about recycling they are really familiar with this concept. Is something we ALWAYS do, at home, at school at work. We are very conscious that we produce waste and that this needs to be handled!